Zimbabwe – a new chance? Following the ousting of the former president, Robert Mugabe, Zimbabwe has embarked on a path of openness that seemed to be unimaginable a couple of years ago. The new president, Emmerson Mnangagwa, has pledged to re-engage with the international community and subsequently normalize relations between them and Zimbabwe, a move seen by all observers as a unique chance that the former breadbasket of Africa has in order to become a real life phoenix. But is this all for good or are we merely witnessing another attempt of trying to appease to the international communities? In November, Robert Mugabe was forced out of power after a 37 years long rule, following a peaceful military takeover supported by a vast majority of the population. Mugabe’s rule, seen by a lot of Zimbabweans as counter-productive – especially in the last couple of years of his reign – was hailed by most of the country, who welcomed the prospects of a democratic election for the very first time in their entire lives. Now, with the future in their own hands, they await change. Emmerson Mnangagwa, a 75 year-old former vice president known as “the Crocodile”, is seen by many as the perfect choice for the Presidency of Zimbabwe. 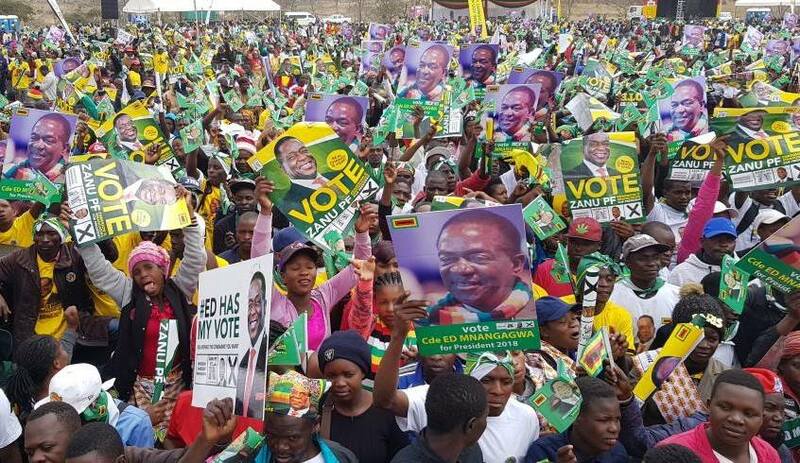 Zanu-PF, the party once firmly controlled by Mugabe, is now at full capacity behind Emmerson and the polls seem to indicate that they will easily win in the upcoming elections. Mnangagwa’s message for the country? A continuous state of economic growth, free and fair credible elections, amendments to the existing electoral laws, openness towards the international community and maybe, just maybe, a readmission into the Commonwealth. “What builds clinics, roads, schools, clean water? What makes jobs? It is business … Zimbabwe is open for business”, President Emmerson Mnangagwa says during a speech. This rhetoric is seen by virtually all as a stark departure from the ideology that was promoted by Mugabe. But truth be told, Zimbabwe is in a dire need of foreign capital, something which has been completely missing from the country for decades. The infrastructure is crumbling, the government debts are massive, millions of citizens need food aid and civil servants go unpaid for months at a time. Things either have to chance now, or the situation might turn dire. “We are fulfilling what we went for in the 1970s: to build a new and modern country. We are going to break out economically at last. Mugabe has stolen the future of the young people. We were sliding into the middle ages. Reforms are in the works that will make us the optimal destination for investment in the whole of Africa. Discipline, organisation, education and stability will be the building blocks of the future”, says Chris Mutsvangwa, a presidential adviser. It’s pretty obvious that the average Zimbabweans are fully embracing this change of perspective, given the hardships that they had to endure over the past years. Prosperity and stability are two terms that aren’t really known to this country, as well as the fact that now they might be ruled by an experienced, moderate and reasonable ruler. But is Mnangagwa bluffing or is he for real? Emmerson Mnangagwa, a former spy chef and Mugabe’s right-hand man for decades, paints himself as the saviour of the people nowadays, but he was formally accused by the international community of being involved in the massacres in the early 1980s, when tens of thousands of civilians in Matabeleland were either killed or tortured, as well as the brutal repression of the MDC in the recent years. His change of heart against his former mentor? The fear that the 94-year-old ruler might put his younger wife, Grace, at the helm of the country, and not an experienced revolutionary. Acting in a swift manner, Mnangagwa seized power, then shocked the world with his messages. “We removed a dictator in November 2017 but we did not remove a dictatorship. These are not change agents” said Tendai Biti, a top MDC official. The international community has seen these changes as welcoming, but the opinion regarding Mnangagwa is still divided among western diplomats and analysts. Some are convinced that the president really wants to be seen as a legitimate statesman who has restored democracy in Zimbabwe, while others see him as an opportunist who “does not have a democratic bone in his body”. Nevertheless, Mnangagwa’s approach at trying to petition the UK for a readmission into the Commonwealth is seen by the British with good eyes, mainly because they need a foreign policy success after Brexit. The Chinese have taken a keen interest in developing their influence in Zimbabwe as well, as they have done in a lot on the African continent. One thing is for certain in Zimbabwe: there’s something in the air that has completely changed – it seems that the feeling of hope has returned once again for the citizens of the country. We just have to wait and see if things truly improve, but there’s one thing that everybody is sure of: they’ve just entered a new age. “We’ve never had an election like this. We’ve never had this much peace … it’s very disorientating”, Mukudzei Majoni said. And that’s exactly the feeling that most Zimbabweans experience now on a daily basis.